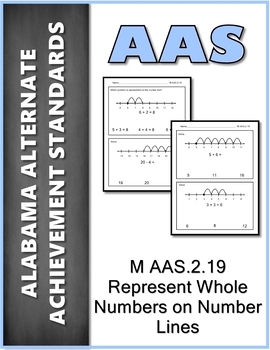 This product is a BUNDLE of all 18 of my Alabama Alternate Achievement Standards review and teaching materials. 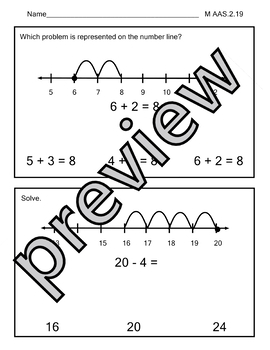 M.AAS.2.19- Represent whole-number sums within 20 using a number line. 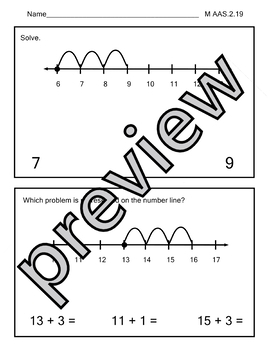 This product has 9 pages (18 practice questions). This product is my interpretation of the standard. The new alternate achievement standards are available on the state department website. The assessment for the 2018-2019 school year will be based on the OLD AAA extended standards, but we are still required to teach the new alternate achievement standards for the 2018-2019 school year. I will be using these in my classroom to teach the new standards and as documentation of new standards being covered. I plan to make a lot of new products for the new standards including task boxes. Make sure you follow my store, to get notifications when I add new materials.